This week I won the Kalahari Augrabies Extreme Marathon in a course record time of 22:02:57. It was a fantastic race and amazing experience to run with my dad and brother in a South African National Park. Running hard during Stage 4. On the finish line with my brother right behind. It's a few days until the race (I start on Saturday 19 October) and again I find myself with that pre-race feeling of a mix of nervous energy and excitement. I'm looking forward to running hard in a new place that I've never been to before with some great competitors. During the race I'll have limited communication and the race organization will also face the difficulty of trying to provide updates on the competitors from the middle of the desert. However, there are a few ways to follow the race and message me during the week. The KAEM team will be putting updates on their website, updating the Facebook group and posting videos each night. Their official communication promises that "The website will be updated daily with article, results, photos and video". Vanessa will be taking over my twitter account @dwrowland and posting updates to my Facebook page each day. So that you know it's her, any tweets or updates she writes will be followed by (VW). Each day you can send me an email which I should receive (delayed) at camp the following night. To email me you need to use the runners' email address and put my name and bib number in the subject line. [You can also email my dad - Jonathan Rowland 263 - and my brother - Brian Rowland 255]. Thank you to everyone who is following the race and trying to keep up with my progress. I know that it's difficult when the updates are sparse, but I appreciate the support and knowing that you're out there trying. It's almost race time so that means it's time to put together my race pack and food. I love this side of the preparation process and it's always fun for me to think about and optimize my gear. I feel very confident that I have a great set of gear that is both light, functional and sufficient to support a good race. This is my third multi-stage race so it has been easier to decide what to take based on my previous experiences and the testing that I did in my blocks. To see the evolution of my gear you can go through my previous posts showing what I took with me in the Atacama Crossing in 2012 and 2013. First up, a look at my race clothing and the non-food contents of my pack. Gear for KAEM13 from Daniel Rowland on Vimeo. My race clothing is shown in the photo below and followed by a list with all the details of what I'll be wearing. Anything with an "(R)" after it means that the item is included on the mandatory required gear list. My clothing for when I'm running each day. In my pack is the following gear. A lot of it is shown compressed into ziploc bags to keep it clean and small for packing. My pack and the non-food contents. Here's my food for the race. It's not all packaged for the race as this video is before I travel, but there aren't too many changes needed. The Ensure will go into ziplocs, my bars will be wrapped individually and I'll look to see if there is any other trimming or repacking I can do to reduce weight and volume. The race requirement is for a minimum of 2,000 kCal a day for a total of 14,000kCal during the race. Food for KAEM13 from Daniel Rowland on Vimeo. My food is about 3.6kg and close to 15,000 kCal for the week. It's made up of the following items. Food for seven days in the desert. My pack weight will be a little over 6kg (before water) when everything is packed and ready for the race. I'm pleased with that weight as it is close to what I took to the Atacama Crossing this year, yet I managed to include a greater total number of calories. My pack comes close to 10-12% of my body weight which is the general guideline for seven-day multi-stage race packs. If you have any questions or want any additional detail, please feel free to ask in the comments. 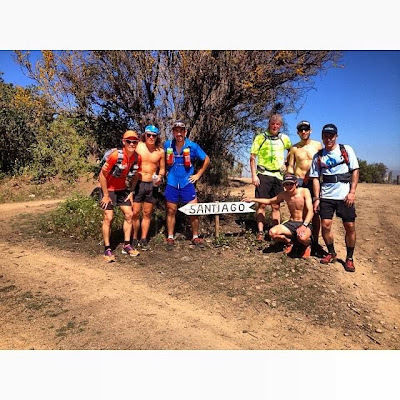 Yesterday I ran my final group run in Santiago before I leave on Tuesday for South Africa for the KAEM. It was great to receive support from Lafuma and my fellow runners and friends. We ran into the hills from Mall Sport, and afterwards held a short presentation at the Lafuma store. The trail community in Santiago is fantastic and I'm grateful to be a part of it. #bosses from the BossJogging team. A pre-run photo in the Lafuma store. Happy to be running with a great group. On an old road to Santiago (photo: TrailChile). After the run I gave a presentation on the KAEM race and an overview of my training for it. It was fun to share my journey with the group and I hope I gave them some useful insight on what it takes for me to prepare for a multi-stage race. 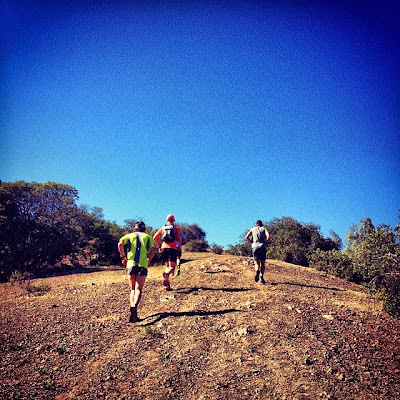 Sharing some thoughts on training for multi-stage races.